ABOVE: In many European businesses, credit-card readers have keyboards for entering the PIN numbers used with "smart cards." INSET BELOW: In some countries, such as France, cards with embedded microchips are required by ticket machines, self-service fuel pumps, and other newer vending devices. Some businesses say "no" or set minimums. Street vendors, hole-in-the-wall cafés and restaurants, and tiny old-fashioned shops don't always accept Visa, MasterCard, or the local equivalent. Also, some businesses won't accept cards for smaller purchases (e.g., under 20 euros). To avoid getting caught short, carry at least some local currency. Watch for hidden fees. Increasingly, banks and credit-card companies are charging hidden "foreign transaction fees" of 2 to 5 percent on purchases outside the cardholder's home country. 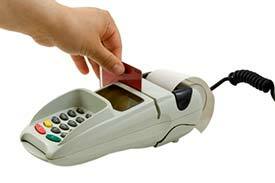 Often, such fees are charged even on transactions in the cardholder's own currency. See our Credit-Card Surcharges article for more information (including how to avoid such fees). Avoid cash advances. Instead of getting cash with your credit card (and paying fees plus interest for the convenience), use your bank ATM card--but watch out for the exorbitant ATM conversion fees that many banks are charging these days. Carry a backup card, and bring photocopies of cards with you. If you own more than one credit card, carry a backup card just in case your primary card doesn't work. If you can carry the backup card in a different place from your main card, such as a hidden "neck safe," so much the better. Also, it's wise to make photocopies of your cards (including the customer-service phone numbers on the back) so you can report any theft or loss of your card immediately. Keep the paper copies separate from your cards, and if you're traveling with a companion, let the other person have a copy of your card information. Guard your cards! Don't carry credit cards in a backpack, a carry-on bag, or a suitcase, and don't keep your wallet in a hip pocket or a belt pouch. Pickpockets and purse snatchers know that tourists are often careless, so they'll be watching you. For more advice about money and travel, click the navigation links below. Top photo copyright © Midhat Bakar. Inset photo copyright © Mats Tooming.